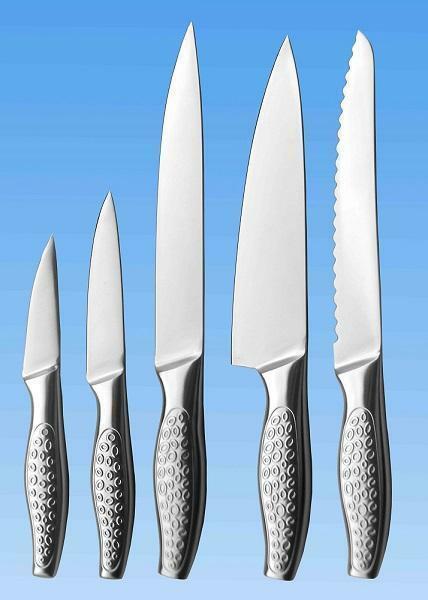 5-pc Kitchen Knife Set | All Stainless | Fish Belly Shape Handle with Pattern(KET-102) - Keywood International Inc. This 5-piece cutlery knife set is composed of all stainless steel design for a mono-chrome, silver display. Heavy bolster allows for balance and added control. The fish shape handle is with beautiful patterns and make it uneasy to slip while use. The cutting edges are sharpened with professional craftsmanship for an effortless cutting experience. High carbon stainless steel for durability.